Olomouc (pronounced OH-la-mootz), the historic capital of Moravia in the east of the Czech Republic, is known for its cheese. Non-Moravian Czechs figure there are two types of people in the world: Olomouc cheese-lovers and sane people. The syrečky cheese — which is aged under hunks of meat — is so much part of this region's identity that when the European Union tried to forbid the product, the Czech government negotiated for special permission to continue to rot their milk in the time-honored Olomouc tradition. Olomouc provides the perfect antidote to trendy, crowded Prague. Just two hours away from Prague by express train, Olomouc makes a fine daytrip. While you're not likely to see a single American in Olomouc, you will see a McDonald's — perched regally on the vast main square. It's the favorite of local children. They demand French fries and vanilla ice cream for birthdays, and eat with gusto while the whole family sits around watching and taking photos. It's entertaining to hang out here with folks from the countryside who come here proudly dressed in their Sunday best, for a "Bikmek" taste of the world. Rather than a Bikmek, for me Olomouc's charm is its provincial Habsburg ambience with a crusty, now kitschy layer of Communist charm. Its circa-1950s train station — small, cute, and almost toy-like — is still decorated by propaganda murals. Travelers are greeted by mosaics of bright, happy workers and peasants dancing around their hammers and sickles with a Maypole-type gaiety. While there's plenty of bad Communist heritage, one good leftover from that era is fine, still-subsidized public transit. Riding from the station into the town center for pennies, you notice how public transit is second nature for locals with dirt-cheap monthly passes who likely will never own — or need — a car. 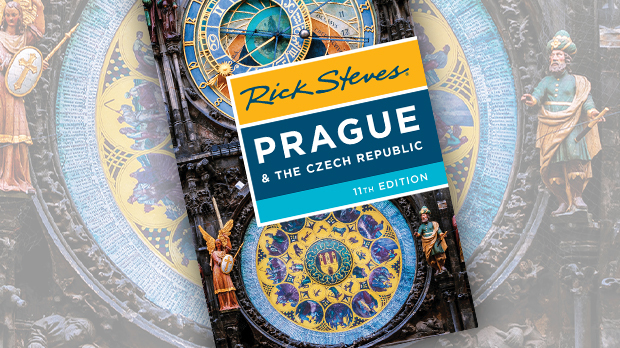 As in Prague, the centerpiece of the town square is a huge medieval astronomical clock. Destroyed in World War II, today's version was rebuilt in 1953 by the Communists — with their flair for propaganda. In the Social Realist style of the Communist era, rather than saints and Marys, you have earnest chemists and heroic mothers. High noon is marked by a proletarian parade as, for six minutes, a mechanical conga line of milkmaids, clerks, smithies, medics, and teachers — are celebrated as the champions of everyday society. As in any proper astrological clock, there's a wheel marked with the names of 365 saints (one for every day of the year), so you'll always know whose special day it is. But this clock comes with a Moscow-inspired bonus — small red bands splice in the birthdays of Communist leaders, too, such as Lenin (who was born on the 112th day of the year in 1870). Stalin, born on the 355th day of 1879, shares his day with St. Toman. And the clock's designers were optimists — the mechanism displaying the year is capable of spinning up to A.D. 9999. Olomouc's few surviving Communist-era lamp posts come with twin 1970s-era speakers. To locals they also come with poignant memories. These were the blaring mouthpieces of governmental boasting of successes ("This year, we will have tangerines for Christmas") and calling people to action ("There will be no school tomorrow as all will join the farmers in the fields for an abundant harvest"). A showcase of Baroque city planning, Olomouc is the Czech Republic's fourth-largest city (pop. 100,000) and harbors Moravia's most prestigious university. Students rule the town. With its wealth of cafés, clubs, and restaurants, Olomouc is the place to taste a vibrant Czech culture for half the price of Prague. Olomouc has pride. While it ruled Moravia from the 11th century until 1642, today it's clearly playing second fiddle to Prague in the modern Czech Republic. Locals brag that Olomouc has the country's second most important bishopric and its second university. Olomouc actually built its bell tower in the 19th century to be six feet taller than Prague's. Olomouc is unrivaled in one category: Its plague monument is the tallest and most grandiose anywhere. Squares throughout Eastern Europe are dotted with similar structures, erected by locals to give thanks for surviving the great plague. On consecration day in 1754, the most powerful woman in Europe, Habsburg Empress Maria Theresa, knelt to pray — devout...yet green with envy. Crazy Olomouc had a plague column grander than Vienna's. For a taste of workaday Moravia, a little nudge on Stalin's birthday, and some cheese you'll never forget, consider Olomouc.